One of the most memorable dinners I’ve had on the island of Hvar (and there have been quite a few) was at the Konoba Dvor Duboković in Pitve. That’s lower Pitve, not upper Pitve, though it’s quite high enough to have glorious views. 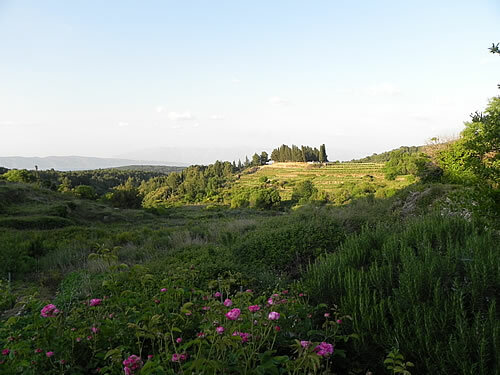 Pitve was the site of an ancient settlement, believed to be the oldest on the island, certainly there long before the Greeks settled in Faros in 384 BC. 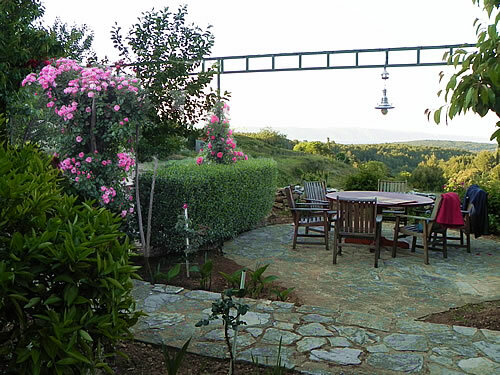 And you can see why this would be an ideal location to live – hidden away at the top of a fertile valley where you can see for miles. It was important to see before you were seen! Today’s Pitve is a delightful jumble of old stone houses and twisty little alleyways. One of these days I’d love to go and explore more, but for now, we simply turned left towards the Dvor Duboković where we were expected for dinner. 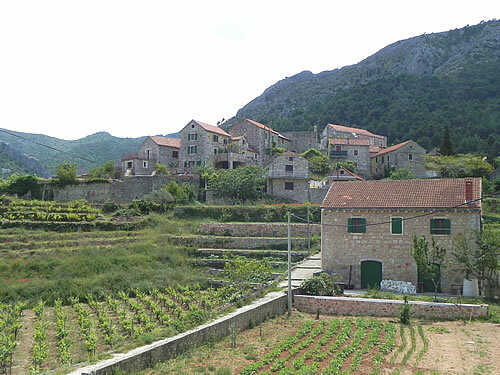 Dvor Duboković is set in the rambling courtyard of a lovely old stone house. 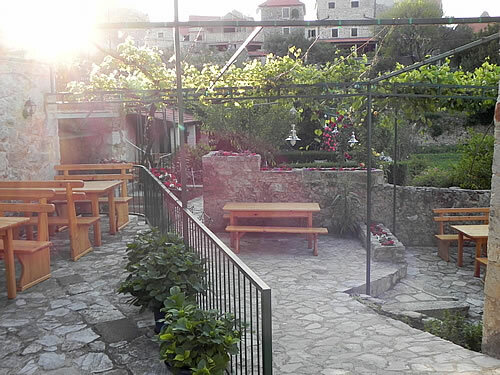 There are flowers everywhere, and the hosts – father and son – Ivica and Frankie Duboković are friendly and welcoming. Our dinner has been pre-ordered and has been cooking since some time earlier this afternoon. 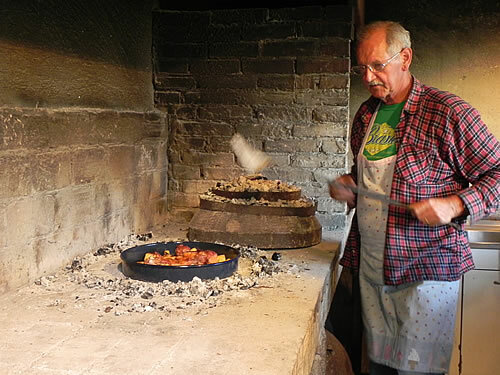 It’s being roasted under the peka, the quintessential Dalmatian style of slow cooking. 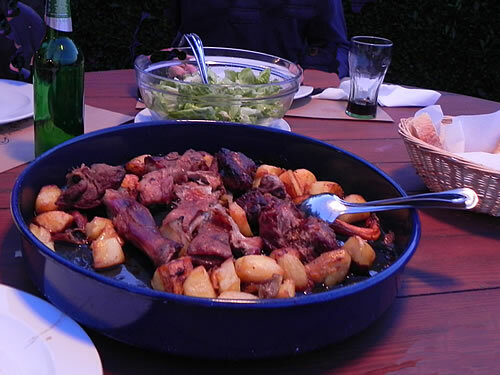 With drinks in hand, we strolled over to examine the food under the peka. 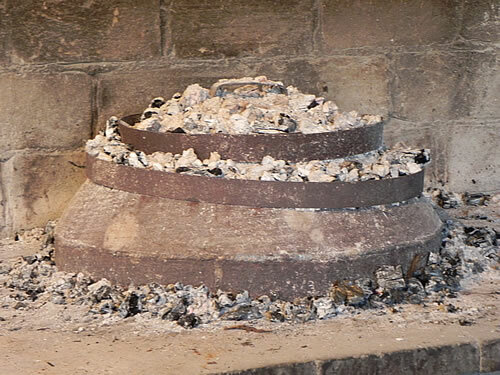 The word peka literally means “roaster”, but is generally translated as food cooked “under the bell”. Tonight’s dinner is a tray of meat, sitting on a stone bench, covered by the peka which is then covered by warm embers from the fire. The amount of embers on top of the peka is adjusted to control the temperature. Now, I personally don’t eat meat, so there was another large tray of grilled vegetables, which was to be our starter, and fish for my main course. It all smells wonderfully promising! And so we wander over to our table with a view. The restaurant overlooks the lovely valley running down the the bay at Jelsa. Beyond that you can see the island of Brač, and off to the right, the mountain of Biokovo on the mainland. Come here to watch the sunset, as the colours shift from daylight through the warm tones of orange, red and pink and on to blues and violets as the earth shadow rises and darkness falls. Lights start to glimmer on the far shores, showing where the towns are. And right here, next to the wall, are the fragrant red roses that go into the wonderful rose liqueur. 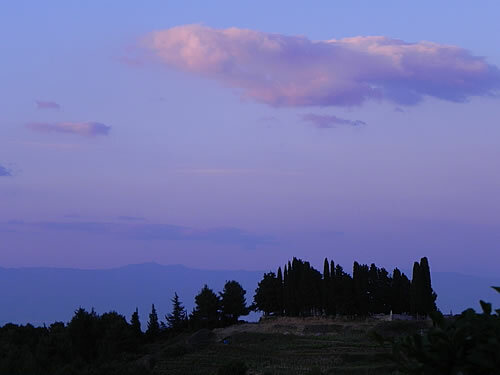 The house red, as you would expect, is home-grown and produced from the Duboković’s own vineyards, which are probably some of the ones we see below us. It’s rather good. The selection of grilled vegetables arrives, along with slices of ham, cheese and plenty of crusty bread. The veggies are perfectly cooked and very tasty. In fact, all the food was great – the fish was wonderful, and I understand from my friends that the meat platter was truly magnificent. It certainly all disappeared! To follow, we were served rožata – which is usually a fairly conventional version of creme caramel, but in this case had been flavoured gently with rose syrup to create a light and fragrant dessert way above the ordinary. I really have to learn how to make that! 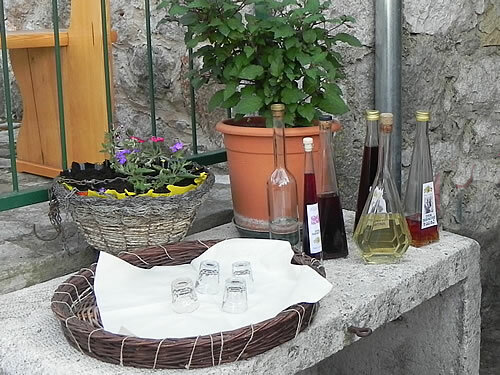 To that end, we wandered back over to the liquer table, where Ivica explained how the rose syrup was made by layering rose petals and sugar. My new project for the summer! I’m going to finish up by including a youtube video showing a convivial evening at Dvor Duboković with the excellent Klapa Bagulin. Note: You do need to pre-order if you want your food slow-cooked under the peka.